When Saint Clair Systems purchased Norcross Corporation in 2014, the transaction brought together more than 100 years of viscosity control expertise. Norcross had been writing the history of viscosity for more than 75 years. It began with the company’s founding by Austin S. Norcross in the 1930s, and his invention of a patented, simple and reliable viscometer that quickly became the standard for viscosity measurement in the textile industry. Since that time, Austin’s son Robert and his grandson Robert Jr. directed the innovations and product developments that established Norcross as the premier supplier of industrial viscosity control systems not only in textile production, but in a wide array of industries including printing, packaging, electronics, energy, automotive manufacturing, and food production. 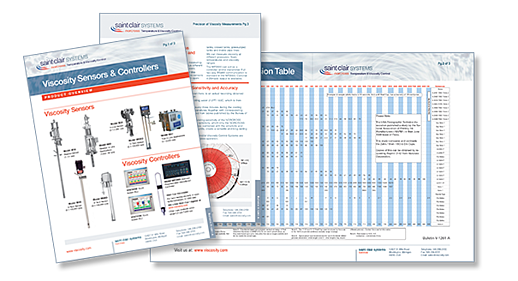 While Norcross supplied viscosity measurement and control systems, Saint Clair Systems has been controlling viscosity using temperature since 1990. Both approaches are effective and appropriate for different environments and applications, but the ability to combine the two technologies expanded the solutions and benefits Saint Clair Systems has been able to provide its customers. Through its patented technologies and processes, Saint Clair Systems delivers improved performance and across-the-board temperature and viscosity control through all phases of fluid delivery, thus effecting reductions in scrap, rejects, rework, solvent adds, labor, and harmful VOC emissions.